I am defining Sunrise/ Sunset paintings as images where the sun is placed in the picture. These situations are more difficult to pull off and the approach needed is counter intuitive to the way a painter normally handles an outdoor sketch. Sunrise and Sunset painting are the two extreme situations of lighting that are the most tantalizing for the outdoor painter and they are the situation we all try eventually. 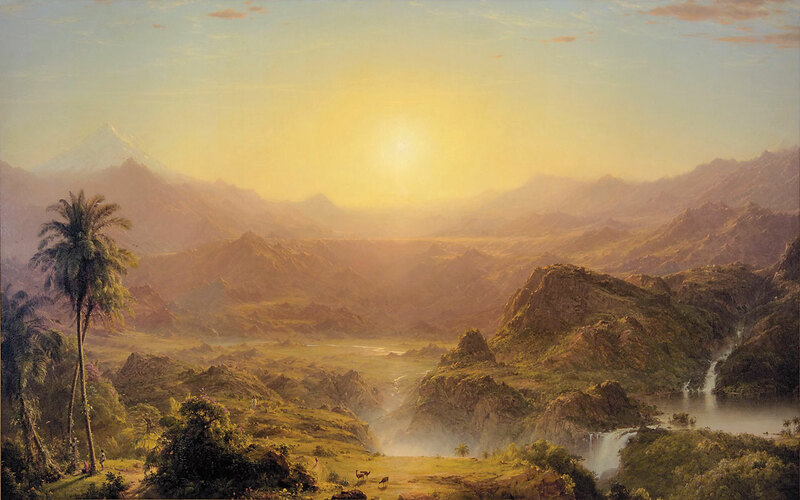 Personally I think painting a scene with the sun it, unobstructed by anything, is an impossible task. Even paintings by my favorite artists of this subject fall short, in my eyes. A much more effective approach is to have a scene facing the sun with its orb blocked or partially blocked by some object or meteorological phenomenon. These scenes are possible and there are many fine examples of them in the history of representational painting. There are two general ways to approach these kinds of scenes. The first is to focus on the contrast between sky and land, relinquishing strong color for one or the other major elements and relying heavily on strong values of light and dark. The second way to approach this subject is to key the values and color to a narrower range to heighten the overall effect of light in the scene. Both of these approaches take skill to execute effectively. The composition and the design of these scenes take on a higher degree of importance to coordinate all of the elements successfully. Making the scene brighter around the sun requires to raise the saturation of the paint, to make it look lighter you raise the value. Many painters confuse these aspects and their paintings suffer because of it. 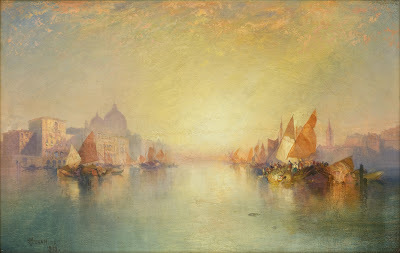 In these kinds of scenes you must lower the saturation and the value for the rest of the painting away from the sunlight. In my opinion paintings that are keyed to a narrow tonal and hue range are more successful than ones that rely on full range contrast for the effect. 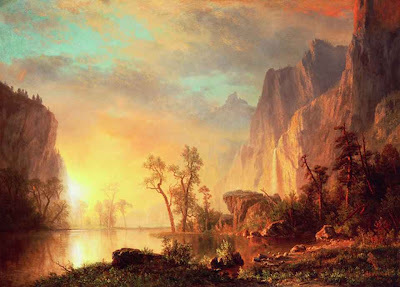 Paintings in this article from top to bottom are, Frederick Church, William Trost Richards,Peder Monsted, Thomas Moran, William Trost Richards, and Albert Bierstadt. All copyrights belong to the respective owners.